Part 2 of Jared Ball interview on The OC Weekly! 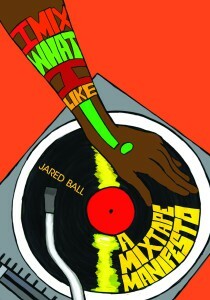 Last week we posted the first section of an interview with Jared Ball, author of I Mix What I Like! : A Mixtape Manifesto on his take on emancipatory journalism, hip-hop, colonialism and black culture in America. We’re very excited to be able to bring you the second part of this great interview by Gabriel San Roman. There’s still time to order the book through akpress.org and receive the I Mix What I Like! installment of the Free Mix Radio mixtape! Just order before July 12th and we’ll include the CD for free! Be sure to check out the original post, which appeared in The OC Weekly on Wednesday, July 22nd! OC Weekly (Gabriel San Roman): A lot of people have popular frustrations with music these days whether it’s what’s on the radio or on the shelves, but they don’t have a way to articulate it. Your book provides helpful information in that regard. Let’s start out with what is called “the Musical OPEC.” What does that term mean? Jared Ball: The phrase “Musical OPEC” comes from Greg Palast who used that phrase in his discussion in The Best Democracy Money Can Buy. It obviously draws the comparison between the musical companies that control popular music and the organization of petroleum exports, the community that organizes the distribution of oil in the world and the power it wields over our daily lives from the cost of gas to the our choice in vehicles. These music companies and their parent companies really have all the power that they’ve earned through corruption [laughs] and as one person I quoted calls ‘economic terrorism’ to take control over cultural expression and the popular culture of people that are meant to be maintained in a social order that I’m describing as colonialism but could be described in a number of many other ways and often is. What does this consolidation of music corporations entail and how much control do they have over the music we hear? These corporations determine everything! They determine what songs go on the radio, what songs get videos, how often they’re played on the radio, what artists get billboards, where they tour, who gets to tour, what venues they get and to a great extent determine who we know to consider to be our favorites and who we never hear from through the simple process of omission and so on. Through a record contract, a corporation gets control over an artist’s product or song, and that ownership allows that corporation to determine through payola, or pay-to-play, how often that song appears in radio, videos, movies or for a video game soundtrack. They make sure that the songs that they own are the songs that we hear most often. It doesn’t mean we won’t hear something else. It doesn’t mean that artists can’t break through that in small pockets and make dents in this thing and have careers with followings though. Who are “The Big 3″ in the music industry? To become truly popular, to truly dominate the public sphere, you have to be supported by one of three major corporations, Warner Music Group, Universal Music Group and Sony, each one of them owned by larger entities with holdings in all kinds of different business all around the world, and they basically sanction whether or not an artist is famous is not. While we think we like something, or that we have some choice in the matter, for the most part, we have very little and we just respond to what these corporations prefer what we listen to or be aware of and of course most of that is nothing that would intellectually threaten their position of power and dominance. You’re going to get a bunch of songs that are vaguely about love, or shaking it, selling this, or smacking that, or buying this. Very little of what becomes popular will encourage us to become thoughtful people or certainly to have what would be considered radical or dissident ideas. I MiX What I Like! is just as much about journalism as it is about hip-hop and the mixtape. The two are, of course, interrelated. Given that, do you think that much of music journalism today is lacking in political economy or critical consciousness? Yeah, certainly in a lot of what is, again, considered most popular. There’s always, of course, exceptions in pockets and even in popular spaces. I’m often impressed by Rolling Stone and some of the journalism they get in that magazine. In general, though, a lot of what we get is fandom and it’s almost a musical equivalent to White House Press Corps press coverage of the White House. It’s like corporate stenographers. It’s more like publicity, promotional work than it is actual journalism. There’s not a lot of critique, or as you’ve said political economy in the questions or the coverage. This is again part of the same problem. The same political and corporate entities that control the cultural expression control journalistic expression. This is why we need to combine radical concepts of journalism, art and mass media communication to circumvent it. One of the major points I’m trying to address is the intent behind the final product. I argue that it is not simply about making money or selling product. It’s really about making sure that we don’t raise fundamental questions about our relationship to this society and how we are going to sustain ourselves in it. These are the questions that if we don’t get serious about asking and answering, we’ll just see the same patterns of negative outcomes continue. There were two recent headlines in the world of hip-hop that are pretty juxtaposed. Soulja Boy gave a shot out to the slave masters, and Lupe Fiasco was on the O’Reilly Factor on Monday after he made comments about terrorism, Obama, the United States, and its foreign policy. What do these headlines tell us about mainstream hip-hop today? It’s actually unfortunate that Lupe Fiasco would even go on that program. I don’t see the value of going on the O’Reilly Factor to argue. That aside, as much as I like Lupe, I don’t consider him a true representative of mainstream hip-hop. My point of view is he’s an exception of the rule at this point. Mainstream hip-hop has become so centrist, right-wing, reactionary and anti-thought, that any degree of thoughtfulness seems like a radical break and something new. Lupe is not representative of what is now mainstream hip-hop, but he is more representative of mainstream thinking within hip-hop. He’s got a lot of attention because anytime you call Obama ‘the biggest terrorist’ and you are, to a relative degree, at the top of the game, that’s what will happen. Soulja Boy’s comments are much more to the point; that hip-hop has been forcibly reduced in its public form to being absent of thought or depth. If we were allowed to hear more of the hip-hop community, we would hear more along the lines of what Lupe said then we would of Soulja Boy and similar comments. That is the fear of those that are in control of all this. There is a long history and long line of documentation, overt and some more implicit, to support this. Those in power want to make sure that the popular discussion or the popular image of those that they most need to oppress will be more like a Soulja Boy than like a Lupe Fiasco. Lastly, a book about mixtapes wouldn’t be complete without one of its own. How can people get a copy of the official I MiX What I Like! mixtape to see how it’s done? People who get the book through AK Press will get a copy of the mixtape. We’re also asking people to go imixwhatilike.com and send me some sort of proof of purchase and we send them a password to get the digital copy online, or we can send the actual hard copy mixtape out. As much as I’m happy to hear the version we’ve done, one of the points I make in the book is that people should take these concepts with their own expertise and put them together and create versions of mixtape radio and emancipatory journalistic projects wherever they are in their local communities. That’s really how it’s supposed to work. That’s the point of the book; that wherever we are, the genius already exists, the talent already exists. I just think we need to re-politicize them a little bit and people will put it together and do all kinds of things with their own wonderful, brilliant and radically imaginative ways. In any event we can make sure they get a copy of the mixtape if they really want one. I MiX What I Like! A Mixtape Manifesto is available now. Order the book via AK Press before July 12th and receive a physical copy of the accompanying mixtape featuring Dead Prez, Malcolm X, Head-Roc, Pharoahe Monch and many others. You can also send a photo of yourself with the book at imixwhatilike.com for the digicopy password.